4/4 is kiln dried, 8/4 is air dried. 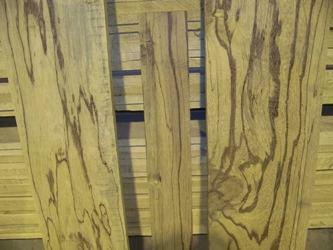 COLOR DETAILS: Heartwood is yellow to golden brown with irregular brown, dark purple and black streaks. 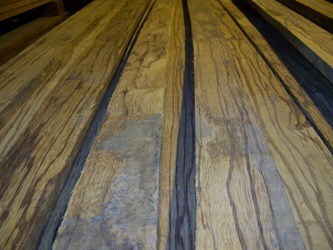 Sapwood is a pale yellow / brown without the streaks. WORKABILITY: Very dense and tends to be difficult to work with. Can have severe blunting effect on tools. Glues, turns and finishes well. High risk of checking and resin exudation during drying. 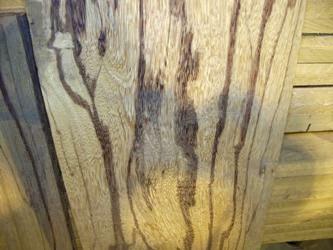 There are many species of Hardwood marketed under the name Marblewood. Wood Vendors offers only the finest Marmaroxylon racemosum from South America. The high contrast between the brownish golden body and the darker streaks is what gives the wood the look of Marble and many say an overall appearance that is very similar to Zebrawood. Call us today at 1-877-983-6367 to discuss your creative ideas using Marblewood.